Of course, it is technically possible to use email software for managing all these things. You can create a folder called “!Read” and a folder called “!Answer” and a folder called “References” (with many subfolders). Apple Mail has some ToDo lists and some Notes function and through MailTags you can add calendar reminders. Some email programs like Microsoft Outlook go a long way in this direction, so they incorporate Address Books, Calendars, To-do lists, and lots of other functions. However, it does not really work. If your whole life is organized by Microsoft Outlook it means you spend your whole life looking at your email. It means you will always be distracted by new and old messages and unable to focus on what’s really important. Moreover, any software which tries to do everything ends up doing nothing particularly well and MS Outlook is no exception. Therefore I prefer the Mac way where I work with a mosaic of integrated apps each on carefully designed to do one thing right. Email is for communication, it’s not your to-do list or reference library. BusyCal is for calendar reminders, AddressBook is for contacts, OmniFocus is for task management, Notational Velocity – for notes, Scrivener is for writing etc. The issue is how to send information from email to these other applications automatically: i.e. without thinking, remembering, switching windows and reaching for your mouse. Let’s start with reference information, something which you think you might need in the future, but not for any specific project. A lot of such information comes as attachments which are discussed in the post on organizing email. But what if reference information comes in the body of email, as plain text? I find it easiest to store such information by forwarding (⇧⌘-F) to SimpleNote, my note-making application which is used in a Tango with NotationalVelocity. I always change the subject of the email in accordance with the note-naming rules, so that SimpleNote creates a note with a meaningful name. If you don’t have a SimpleNote account which allows creating notes by email you can simply select the text and then with the right-click select “Services” and “Create new Notational Velocity Note from Selection”. The next type of information is calendar data, when someone sets an appointment or simply emails you a date of an interesting event. Apple Mail contains a great feature of transferring such information to your calendars on the fly using ‘natural language recognition’. For example, if someone invites you to meet tomorrow at noon you can just click on these words and the necessary appointment will be created in your calendar (see picture). I love this feature so much that I try to clearly indicate the place, date and time of the appointment I am requesting, hoping to save my recipients time (if they use Mac with Apple Mail). If the email does not contain language which can be recognized by Mac, there is still a way to create appointments very quickly, without using a mouse and without switching to your calendar software. The magic trick is done by Fantastical, a great natural language-based calendar application which almost deserves a separate blog entry. The next type of information coming with your email are Action Reminders. They mean that you have to do something, but it will take more than 2 min. Such information should be “clipped” (usually with a shortcut key) into a task management system such as OmniFocus (which I discuss in this post). This is a great invention. If you don’t have time or energy to deal with email just send it to your task management software, archive the message and proceed to the next one! Only be careful and selective. Not everything deserves to become your task or soon your task management inbox will become the same toxic dump as email inboxes of some people. The fourth type of information is Project Support Information. For example, you have a project of submitting your expense reimbursement claim and there is a receipt coming by email. Or you’re writing an article and there comes a useful reference, or a piece of data, or an idea. This type of information is pretty tricky. On the one hand it is similar to reference information except that you will probably use it once and in a very specific context (e.g. the receipt – when preparing your claim). On the other hand it is similar to action reminders (e.g. “include that receipt in my claim!”). When I started to organize my email I used to often record such information in my task management system, because clipping it was so easy and did not require much thought. However, it created problems on the other end: my task management system quickly became cluttered with things which were not really “tasks”: ranging from open-ended ideas to those little receipts. This was distracting and irritating, so I started to be more considered with project support information. I realized that each project has its own workflow. When I am checking students’ assignments I want them all to be in one folder on my computer, but I do not need an action reminder for each of them. In case of such file-based projects I save the relevant attachments on my computer in relevant project folders. (Yes, my project-support information is organized in old-fashioned hierarchical folders, as different from general references which are tagged and automatically filed by date! And if a file is both project and general reference material? Sometimes I keep it in two places, though logically it would be sufficient to save it in the project folder and tag it as well). If I am writing an article I often need information in my Scrivener file (which has a folder called Research where various ideas, references and data can go). If I am brainstorming a website or organizing a meeting I usually keep notes in OmniOutliner. Some of my project notes (which require more narrative and less structure) are kept in NotationalVelocity. That’s why extracting project information from email is tricky: you need to stop and pause: is it an action or is it support information? what is the project? how do I keep notes about it? This requires some discipline, but it pays off at the end. And once you decided where to put the information, the rest is easier. Most Mac applications allow you to simply drag the relevant email into that application. Some apps, such as OmniOutliner, also have ‘clipping’ keys to spare you using your mouse. Finally, what if you receive information which should be read before processing it further? And what if such reading would take you more than 2 min which is the maximum I can usually spend on each individual email? 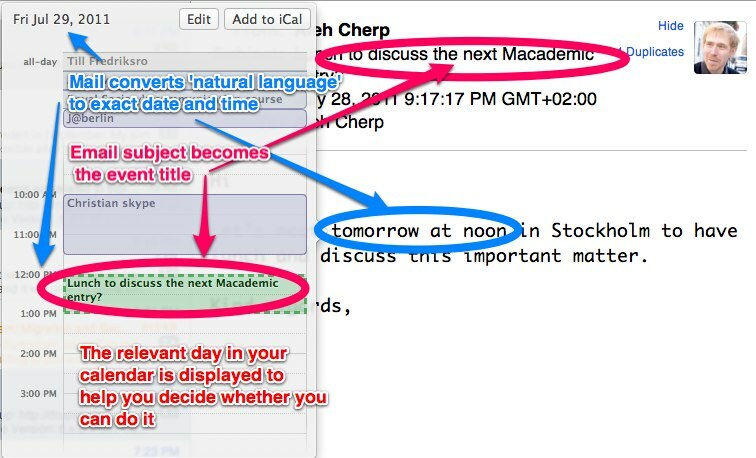 You can of course interpret reading as action and simply clip it into your task management system as described above. I used to do that, but then decided that it is a mistake as my to do lists quickly got cluttered with things which would be nice to read, but … well the world would not end if I did not. So now only very selective reading pieces end up in my OmniFocus, the ones I really really need to read. The rest is processed differently depending on the form in which the reading piece arrives. If the reading piece comes as a hyperlink to a Webpage, I click on it and immediately send it to Instapaper, an amazing free cross-platform software for … reading things later on your Mac, PC, iPod or iPad. If I need to read the plain text in the body of the message I can forward it to Instapaper as well and then read it when I have time. If, however, reading comes as an attachment I often save it as a general reference file and attach the “!read” tag. Even if I don’t have time to read this file, chances are one day I will use it as a reference. This entry was posted in Automation, Email, Tags and folders and tagged BusyCal, OmniOutliner. Bookmark the permalink.